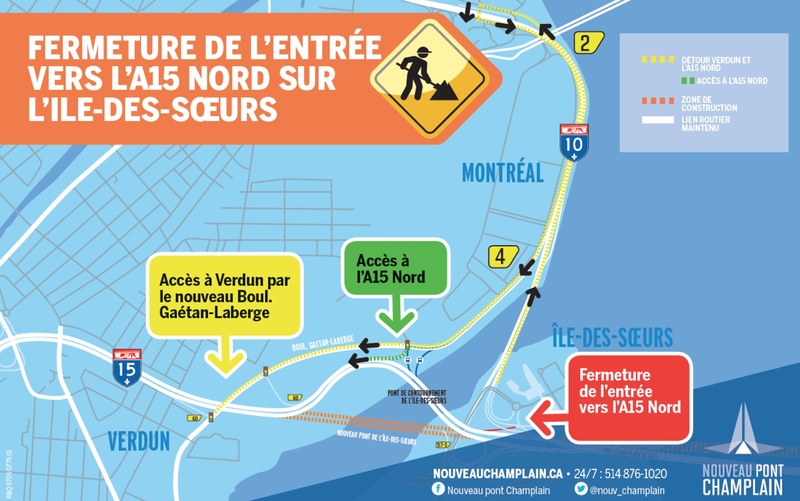 As part of the construction of the New Champlain Bridge Corridor Project, Signature on the Saint Lawrence wishes to inform road users of the upcoming new local network and Highway 15 configurations in the Île-des-Sœurs sector. 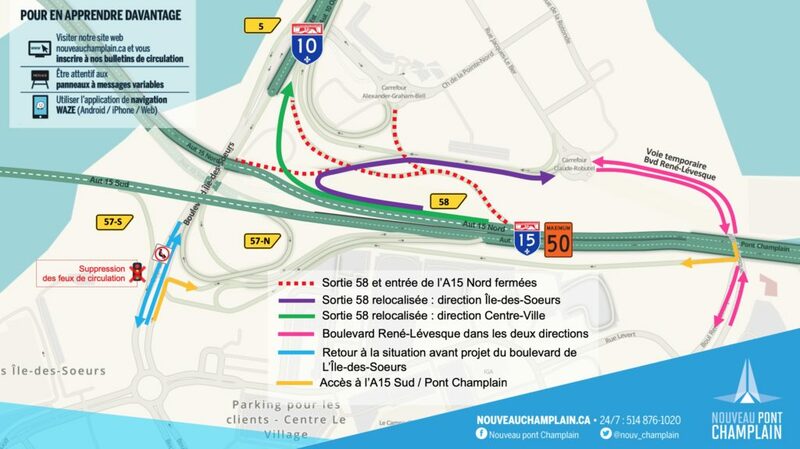 These will enable our teams to build Hwy-15’s paved roadways between the new Champlain Bridge and the new Île-des-Sœurs Bridge, while maintaining optimal mobility throughout the sector. * Dates and durations subject to change. Closures may be cancelled or modified in case of adverse weather conditions or operational constraints. One lane in each direction will be open on René-Lévesque Blvd. between the Champlain Bridge and the Claude-Robutel roundabout. In fall, the pedestrian and cyclist corridor will also be reopened. Traffic lights will be deactivated on Île-des-Sœurs Blvd. From Pointe-Sud via Île-des-Sœurs Blvd. and René-Lévesque Blvd. From Pointe-Nord via René-Lévesque Blvd. 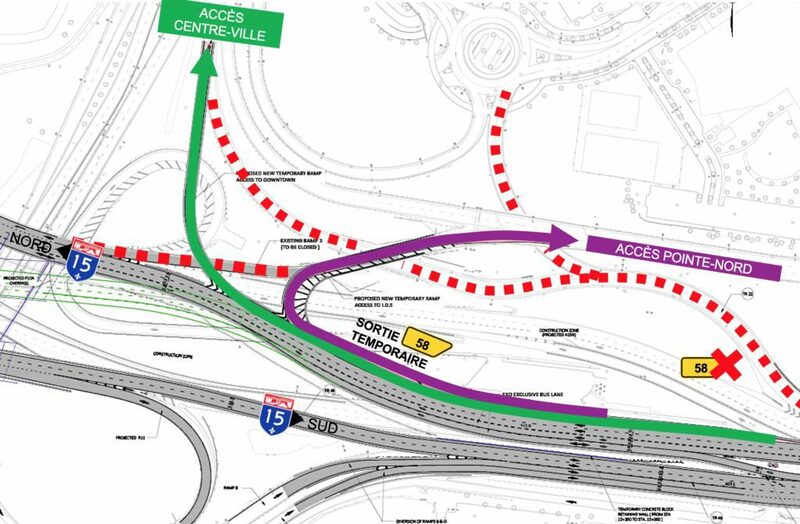 Please note that during this period, access to Île-des-Sœurs from the South Shore will be provided via a temporary exit on a contraflow lane of the Hwy-15 North on-ramp (closed since October 3), which will lead to the Claude-Robutel roundabout in Pointe-Nord. 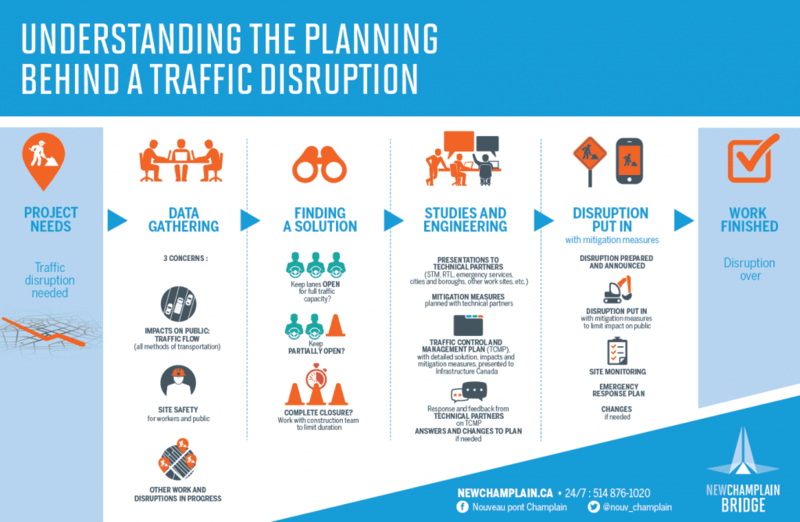 Drivers are urged to check our website or follow us on Twitter @nouv_champlain for up-to-date information about traffic disruptions. You can also learn about major disruptions on the Waze community-based traffic and navigation app (iPhone/Android/Web). We also strongly encourage drivers to check the MTQ website www.quebec511.info before setting out or follow the Twitter account @Qc511_Mtl for information on all disruptions in the Greater Montreal road network. Public transit users can visit the STM or RTL websites to see what impact this will have on their routes and bus stops.